Since my class of older students come from a handful of different schools for their afternoon English classes, I’m kept pretty up-to-date as to when owls are calling the trees of their school grounds homes. My students are also nice enough to draw maps to help me find the specific trees the owls are in so I don’t have to spend hours searching the branches of each tree during the weekend. With my map in hand, I was very delighted to find the tree that the two Collared Scops-Owls were resting in at a nearby elementary school [one pictured above and the other one in today’s Daily Photo]. The Collared Scops-Owl is a small owl [24cm]… The Collared Scops-Owl hunts at night, waiting from a low perch for small vertebrates or large insects, which it then pounces upon… These small owls usually nest in a natural tree hollow or woodpecker hole, and will also use nesting boxes. 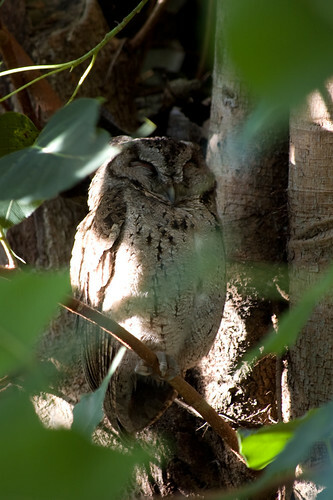 In Taiwan the Collared Scops-Owl is fairly common in forested areas, including treed areas near towns. I wouldn’t worry about the students terrorizing the owls in any form because next to the tree there is a sign posted with info about the owls and the severe punishments students would receive for harming them.